If you’ve never heard of Cytauxzoonosis aka Bobcat Fever, it’s time to become familiar. As one of the most deadly diseases to affect cats that you’ve probably never heard of, it is well worth your time to know the details. Knowing them could mean the difference between life and death for your cat. What is Cytauxzoonosis or Bobcat Fever and how do I avoid it? Cytauxzoonosis or Bobcat Fever, as it’s also known as, is a very nasty and often deadly tick-borne disease. It is transmitted by ticks that have hosted on a Bobcat. It is not transmittable to other animals or people, and can only be transmitted via tick bite. 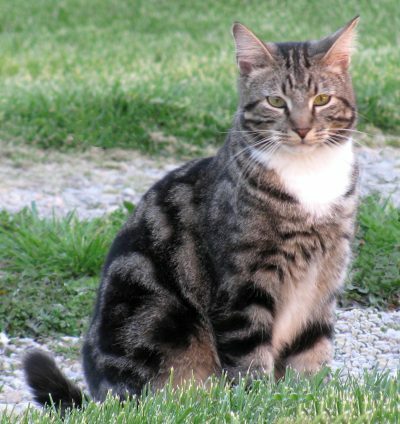 It is such a devious little disease, that a tick can bite and infect a cat after previously hosting on a bobcat and then carried in by the family dog. The bobcat is rarely even affected by the disease that is so dangerous to domestic cats. So dangerous in fact, that cats that are infected by Cytauxzoonosis/Bobcat Fever only have a 60% survival rate at best, with the current and most successful treatment protocol available. Sadly, many cats die within 24-48 hours of diagnosis. So how does one avoid this disease? Well, that’s the tricky part. You can use tick collars, sprays, powders, even keep your cat indoors around the clock to help limit tick bite exposure. Unfortunately, it only takes one tick bite to bring on this nightmarish disease, and nothing is going to be 100% guaranteed. The best defense is to use a combination of methods. Tick deterrents and daily, very thorough tick-checking, including under the tail, one of the ticks’ favorite hiding spots, are the top ones. According to the Merck Veterinary Manual, Cytauxzoonosis/Bobcat Fever cases have been reported in the following states: Missouri, Arkansas, Florida, Georgia, Louisiana, Mississippi, Oklahoma, Texas, Kentucky, Kansas, Tennessee, North Carolina, South Carolina, Nebraska, Iowa, Virginia, Alabama, Illinois, and Ohio. Even though your state may not be listed, don’t let that lull you into a false sense of security. Cytauxzoonosis/Bobcat Fever is not a disease to be taken lightly, no matter how “safe” you think you are. You may actually have cases in your state that just were not identified or reported. It is best to err on the side of caution when it comes to this devastating disease. Two keys to potentially avoiding and surviving this awful disease are removing any ticks from your cat as soon as possible and keeping an eye on your cat for any symptoms. If your cat has been infected, the symptoms usually appear about 10 days after a tick bite. The first sign is usually lethargy and refusal to eat, but can also include difficulty breathing and pale gums. As the parasites transferred from the tick bite enter the bloodstream and are carried throughout the body, the more damage they do. Therefore, the longer the cat goes without treatment, the deadlier the disease becomes. If your cat is showing any of the above signs of Cytauxzoonosis/Bobcat Fever, PLEASE get your cat to the vet to be examined immediately. He/she will not miraculously get better, only worse and by delaying vet care, you are risking losing your cat to a horribly painful and slow death. Nobody knows this better than Kate Lucariello, a cat owner who has dealt with this vile disease firsthand on three different occasions. Kate now helps counsel cat owners whose cat has received the Cytauxzoonosis/Bobcat Fever diagnosis, and are frantically searching for anyone or anything helpful in getting their cat through it. I’ve asked Kate, whom I consulted with myself last June when one of my cats was believed to be infected with Cytauxzoonosis after a day of lethargy and not eating sent us to the after-hours emergency hospital. After Cooper was initially diagnosed that night, I immediately came home and stayed up all night researching this disease I’d never heard of. Luckily, I found an article Kate had written on the subject based on her own experience and she’d provided her e-mail, so I sent her a plea for help. In the end, Cooper recovered very quickly and all the tests came back negative for everything the vets believed he might have, including Cytauxzoonosis. Nevertheless, it was definitely a very scary time and made me appreciate finding Kate and her experience with the disease. Hi, Kate! Thank you for taking the time to share with my readers your firsthand experience with dealing with this horrendous disease. Can you share your background with how you became so knowledgeable of Cytauxzoonosis/Bobcat Fever? Hello, and thanks for contacting me, as I hope I can help other cat owners. I first moved to Northwest Arkansas from the Pacific Northwest with my 19-year-old cat in 1998. Shortly after moving here, my cat was hunched over, wouldn’t move and wouldn’t eat. I had no idea what was wrong, so I took her to the local vet. It’s a good thing I didn’t wait because she was diagnosed with Bobcat Fever, which I had never heard of. I was told it was considered 100% fatal, but they had started to see some success with using antibiotics. This particular vet, unknown to me, was one of the foremost researchers of this disease and had been working with researchers at the University of Oklahoma on trying to find a vaccine or cure. They tried their antibiotics and other support with my cat, and miraculously, she survived, at 19 years old. As a result, she made veterinary history, and I agreed to have blood draws sent to the university in the hopes it might help them find a vaccine or a cure. That has not yet happened, unfortunately. I then became aware of some people in the area who had been using alternative treatments and having some success with beating this disease, so I began to research more on that. As I was also a journalist for the county paper at the time, I wrote articles on all of this. What is your experience with conventional treatment, and has proven to be the one with the highest success rate (if you can call 60% success) of the A&A Protocol, which consists of the antibiotics Azithromycin and Atovaquone as well as the blood thinner Heparin and IV fluids? In the fall of 2015, our male cat was diagnosed with Bobcat Fever, but it was a holiday weekend and our regular vet, who uses the A&A protocol, was not available to see us, so we went to another vet across the county, who did not use that protocol, and our cat died in less than 48 hours in their care. This is not to say that every cat treated with the protocol survives. Even that only has a 60% success rate, and I believe there are other factors that can improve that figure. Last year, our other cat, a two-year-old female, was diagnosed with Cytauxzoonosis/Bobcat Fever. We got her in to our regular vet at the first sign of the disease (that hunched over position, lethargy, and loss of appetite), and they began the A&A protocol, IV fluids, Heparin and, as the disease progressed, something to bring down a very high fever (106º) but not to completely eliminate it, and also a painkiller as it became clear she was hurting. At one point she was breathing shallowly, and they gave her something to ease that also. But I must say, we also added alternative treatment, in the form of Monolaurin, which is lauric acid made from coconuts. It is antiparasitic, antibacterial, antiviral and antiprotozoal, and will not interact with conventional drugs. We were giving her that in an eyedropper every hour at first, then every two as she began to improve, and so on. Our wonderful vet and his vet techs agreed to give it to her during the day when she was under his care, as they had heard of other cat owners using it with success in our community. As they had no one on staff through the night, and she wasn’t hooked up to an IV when they were not there, we brought our cat home every night and continued to give the scheduled A&A protocol and Heparin as well as the Monolaurin through the night. I also used EFT (Tapping) for animals on her. I believe all of this made a huge difference in her survival. Nevertheless, it was touch-and-go, and she spent a total of 13 days in treatment, with the vet convinced at times she wasn’t going to make it. But she did, and after that, it took months for her to fully recover, as there were some immune system issues. What have you learned about the treatment of Cytauxzoonosis/Bobcat Fever since having first experienced it yourself that you want to pass along to others that are going through this with their own cat? I believe a multi-treatment approach such as we took offers the best chance of survival. I think the A&A protocol, Heparin, IV fluids, fever control and painkiller are the best conventional treatment (and it takes open-minded and dedicated vets and vet techs to administer all this). I also absolutely believe in Monolaurin. Even though there are no clinical studies to prove its effectiveness with Cytauxzoonosis, there are plenty of anecdotal experiences from people who have used it, some successfully with no other treatment, but the key is to catch the symptoms early and begin treatment right away. What is your best piece of advice for cat owners regarding a Cytauxzoonosis/Bobcat Fever diagnosis? Well, let’s start with a proactive approach before your cat even gets it. Especially if you live in the areas described above, research your local vets to find out who is knowledgeable about this and whether they stock the A&A protocol or can get it immediately. Buy a bottle of Monolaurin and keep it on hand. (You can get it at Walmart or online for around $10-$20.) You can use Monolaurin yourself for illnesses, as well. Monitor your cat frequently for ticks: vigilance, knowing the symptoms and swift treatment are crucial for a cat’s survival with this. The very first symptom is lethargy, and usually they are in that hunched position, head down. Begin giving the Monolaurin right away. Break open one capsule and mix the powder in enough water to dissolve it. Give one eyedropper full and then get to the vet. Bring the Monolaurin with you. Even if your cat does not have Cytauxzoonosis/Bobcat Fever, the Monolaurin will not hurt and will help with anything else that may be going on. You may not see a tick on your cat. Don’t waste time waiting to see if your cat pulls out of it – they can die within 48 hours of the first visible symptom. Later symptoms include the third eyelid showing, jaundice, fever, and weakness. Get to the vet immediately and tell them you suspect Cytauxzoonosis/Bobcat Fever. Don’t take no for an answer if they say things like, “Well, we haven’t seen it around here” or “Oh, it’s probably just a cold.” Insist on a test for Cytauxzoonosis. Even then, the organisms may not show up in the blood. Next, insist on the A&A protocol, which has the best survival rate so far. I wouldn’t mess with anything else. It is expensive, but it is worth it if it can save your cat. Finally, if you can get the vet to agree to give Monolaurin, leave some with them to administer. And if no one is on staff overnight, bring the cat home and give it yourself, then take the cat back for treatment during the day. Dosage is as follows: Mix one capsule in 1/8 to 1/4 cup water and give one eyedropper full every hour for the first 24 hours, then every two hours and so on after that, as the cat continues to improve. In the last two months, I have had three cat owners (one in Missouri, one in Arkansas and one in Tennessee) call me in a panic because their cats were diagnosed, and were at the later stages. In all cases, the vets were not very proactive and did not try the A&A protocol. All three cats died. This may or may not have been their fault, but might those cats have had a better chance of survival if those measures had been taken? It is my hope that cat owners can become educated about this before they have to go through this excruciating loss, and their cats this torturous agony. I am available to counsel anyone who calls me, but I am not a medical professional. I can only share my experience and the experience of others who have gone through this. I can be reached at 479-253-6211, or by email at klucariello@gmail.com. If you get my voicemail, please leave a message so I know you are not a telemarketer. Thank you, Kate, for taking the time to share your valuable experience and offer of assistance with us today. I’m sure it will no doubt help others out there who are either going through this ordeal currently or find themselves doing so in the future. Hopefully, all of my readers will share this post to their Facebook pages, Pinterest boards or even do as I do and add the post link in an e-mail to themselves and then put it in a folder for their pets’ health for future reference, in case they ever need a quick reference on this disease. Disclaimer: Kate nor myself are medical or veterinary professionals of any kind, we are just offering our own experience and knowledge on the subject. You know your pet better than anyone and regardless if you live in a possible bobcat area or not, it is always best to err on the side of caution and take your cat to your vet if it becomes lethargic or refuses to eat or drink. Thank you for getting this information out. We just lost our beloved Spud to Cytaux. We live in central Oklahoma. Had never heard of this disease. We weren’t prepared for it’s rapid onslaught. ; he declined within a couple of days and we euthanized our boy 2 days ago. Of course, the family is sad. But, I’m angry! Our vet (a respected cat clinic) immediately suspected bobcat fever, but told us we would need to start calling pharmacies if we wanted to start the A&A treatment. Why don’t vets have resources for this drug? We were told every hour counted. Yet, I found myself calling Walgreens and other local pharmacies trying to expedite shipment of this stuff. We’d read that it’s efficacy is only about 60%, but that seemed like pretty good odds to us. Feeling like our vet let us down. I am so sorry that happened to you, Sheila! I would be angry too, as to my way of thinking, there is no excuse for a vet located in one of the states where Bobcat Fever is prevalent (and Arkansas, Missouri and Oklahoma are the epicenter of it) not to be well-versed in the best available treatment for it, and not to have it on hand or have a way of getting it rapidly, as life or death truly is a matter of hours for afflicted cats. That said, as I noted above, I would encourage cat owners to ask your vets well ahead of time whether they know about the A&A protocol, have it on hand or are willing to get it right away and begin treatment. If not, are they open to getting educated about this and making changes? If not, find another vet who is. I know this may sound harsh, but better to be prepared and have increased your cat’s chances of beating this than to lose your beloved companion. The other thing I am beginning to consider, and I would urge other cat owners to do this: as I noted above, buy a bottle of Monolaurin and keep it on hand, just in case. Also, through tick season, give it to your cat as a preventative. It’s not going to hurt the cat and will not interact with anything else the cat is taking. I am starting to do this myself, this being a very bad tick year, and we have already pulled a few ticks off our cat. I am breaking open a 550 mg capsule and sprinkling about one-third of it in her (wet) food. I’ll do this a couple times a week and see how it goes. My cat may be immune to Cytaux now. I just don’t know, but I’m not taking any chances.